One of my favourite areas at the moment is this mixed planting where the foliage looks like a green carpet of form and texture with flowers over the top. 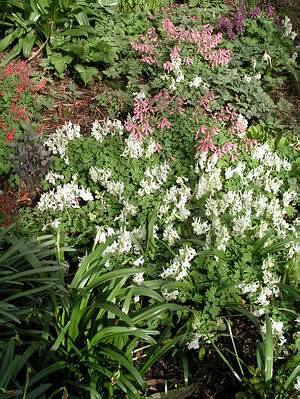 This is the same bed a month or so ago when it was a tapestry of corydalis, these have died down now and have been replaced with dicentra. 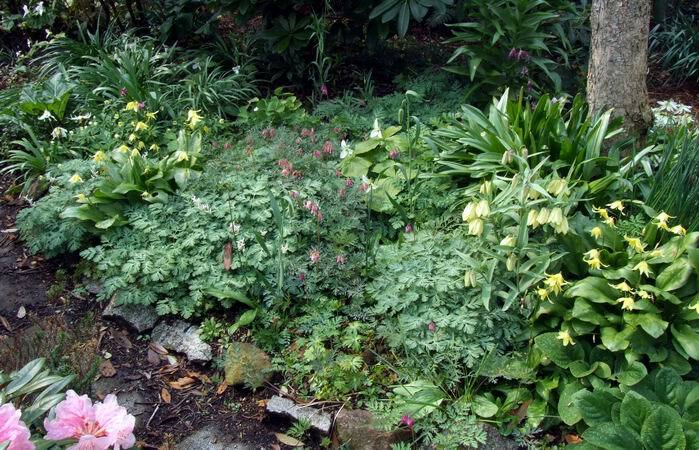 Various bulbs such as Fritillaria pallidiflora grow happily through this green tapestry giving a very pleasing effect. I much prefer Fritillaria pallidiflora in the garden, we do have some in pots but it is one of the larger frits that I think looks much more at home in the garden. I have a few more Erythronium hybrids to show you this week - firstly my own 'Craigton Cover Girl' which has formed quite a substantial clump at the base of a laburnum tree. It is almost impossible to lift and split this clump because of the laburnum roots so I also grow Erythronium 'Craigton Cover Girl' in fish box troughs which can be tipped out every year or two to speed up the rate of increase, there are so many people wanting to get hold of it. 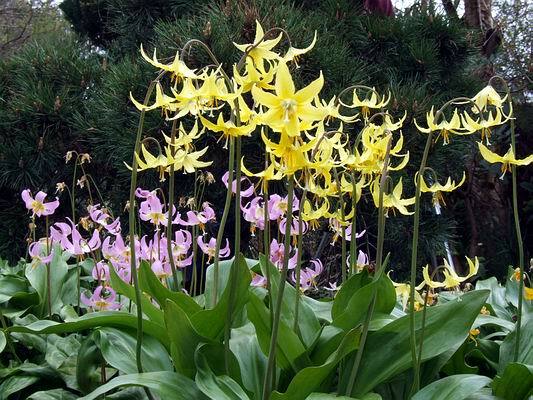 Erythronium Susannah is my favourite of the E. Tuolumnense hybrids but unfortunately it is also still quite scarce and not often available for sale as yet. Likewise Erythronium Joanna which I only got a few years ago from John Amand, whose daughter it is named after. I am growing this bulb in a plunge basket in the sand bed so I can repot it every year. This is the quickest way to increase these hybrids as they grow on better if the compost is refreshed each year and, by separating the small offsets from the bigger bulbs, they also reach flowering size quicker. I do not normally like hybrids that involve pink and yellow flowers because as a rule they turn out to be a dirty colour. 'Joanna', however, is successful and I do like it - I think Joanna is a hybrid between Erythronium tuolumnense and revolutum. 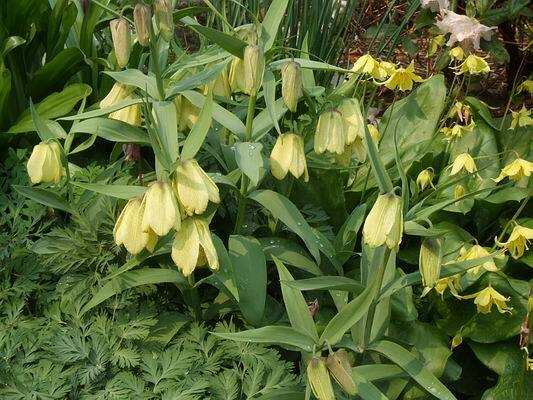 Among the other bulbs flowering in the garden beds are Fritillaria meleagris and pyrenaica; both excellent garden plants. In fact I find both of these species grow better in the garden as they seem to resent being grown in pots for long periods - I suspect that they dislike being too hot and drying out too much in the summer months. Our Glaucidium palmatum are just coming into flower. We have lots of the purple ones in varying shades as they are seed raised. I am very pleased to have the white form back in the garden again after we lost our original plant in a territorial battle with a large rhododendron - it was simply over grown and we should have moved it before it died. ing the other smaller plants and have now planted the Paris beside a companion species. One I am sure is Paris polyphylla, I am not sure what the other species is; we grew them from seed just distributed as Paris sp. maybe some one out there can help me put a name to them. 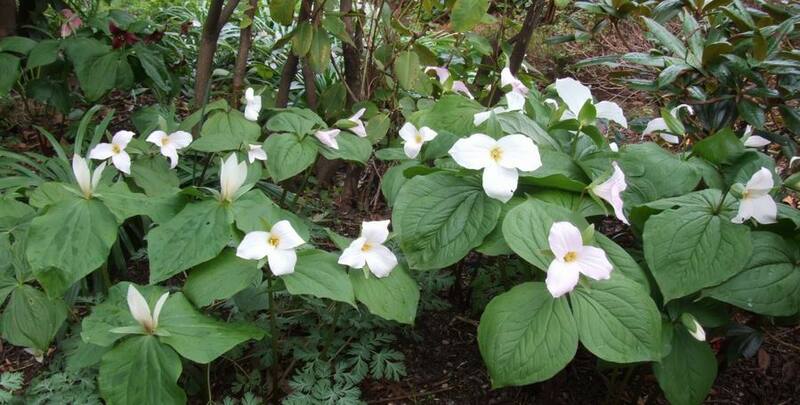 The Trillium grandiflorum planting that I made from the pink flushed seedlings is maturing nicely now with many plants having two or three stems. 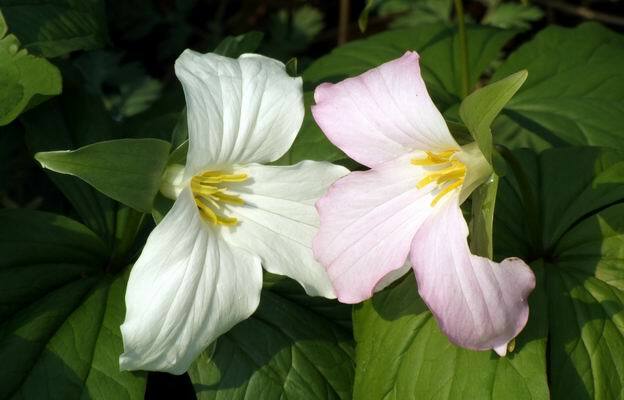 It is nice to see the pink and white forms growing together, each one compliments the other.